Every project I do is custom, so I only keep tintable products on my shelf. 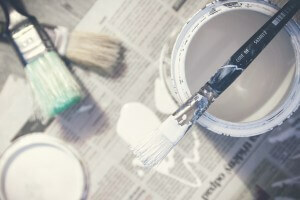 However, there is a good reason to hang on to the extra paint from any remodeling project! Accidents happen, whether due to water leaks, careless furniture movers, or the purchase of a new piece of artwork. I usually provide a repair kit to my clients because custom colors can rarely be matched perfectly. This repair kit can be hidden away in the event that damage occurs to a small area of a custom decorative finish. When packaged and stored properly, the paint can last for years. Of course, after creating a “damage control” kit for a rainy day, you may still end up with excess paint left by a contractor. Don’t go tossing it in the trash just yet; here’s what you need to know about disposing of leftover paint. If the paint is in good condition still, donate it to an appropriate organization so it can be put to good use. Check with your local recycling center. Some will accept cans of paint, and can even use it to create recycled goods from plastics to cement. If it is a water-based latex paint, then and only then should you throw it away. The paint must be dry, so mix in some kitty litter or shredded paper and let it sit open until it has hardened. Lastly, if you have oil-based paint you will need to dispose of it at your nearest hazardous waste disposal location. Paint should always be stored in the smallest container possible to decrease the amount of air in contact with the paint. Laying a circle of plastic wrap over the surface of the paint will not only prevent that annoying film from forming on the surface, but will also keep dried paint particles from falling into the fresh paint. While you may be thinking of storing your paint in the garage, it’s better to choose a climate controlled area of your home to prevent freezing. Check out our full post on paint storage for more professional tips gleaned from years of painting decorative finishes in Atlanta. 20+ years in the decorative finishes industry has resulted in a lot of tips and tricks when it comes to paint! For more information about my faux finish and decorative painting services, take a look at the FAQ page.